K-12 Levy Equalization, which sends state money to school districts with lower than average property tax bases: $165 million. Basic Health Plan, which provides health insurance for 60,000 residents: $160 million. Higher Education Need Grants, to 12,300 low and middle income students: $146 million. General Assistance Unemployable, revised to give a maximum of six months coverage at $250 per month: $84 million. All-day kindergarten, gifted program and reading corps: $42 million. Working Connections Child Care, to those receiving Temporary Assistance to Needy Families: $39.5 million. Maternity Support Services, to 50,000 women at risk of “poor birth outcomes”: $28 million. Optional Medicaid, dental, vision and podiatry services not covered by federal program: $21 million. Developmental Disabilities/Long-Term Care Housekeeping and Laundry, for 42,000 elderly residents: $18 million. Developmental Disabilities/Long-Term Care Homecare Provider Services, wages and benefits to individual providers: $14 million. Early Childhood Education and Assistance Program, for 1,500 3-year-olds: $10.5 million. Limiting tax preferences given to companies through court decisions covering mortgage interest deductions, direct sellers, and meat processing: $16 million. Repealing tax preferences that eliminate the sales tax and B&O tax exemptions for bullion, changes to taxes on boards of directors’ fees, and sales and use exemptions for livestock nutrient management: $4 million. Changes to the state B&O tax: $73 million. Changes to tax avoidance rules on the Real Estate Excise Tax: $11 million. Saying that many of the cuts she proposed last month are “unwise and unjust,” Gov. Chris Gregoire proposed a combination of program cuts, tax increases and federal aid to close the state’s projected $2.6 billion budget shortfall. Gregoire told a joint session of the Legislature they face “an incredibly challenging year” and called for swift and decisive action. Majority Democrats praised her for a compassionate approach to an unbalanced budget. Minority Republicans said her proposals so far are short on specifics and would wait to see whether the nonpartisan approach she espoused would actually come to pass. 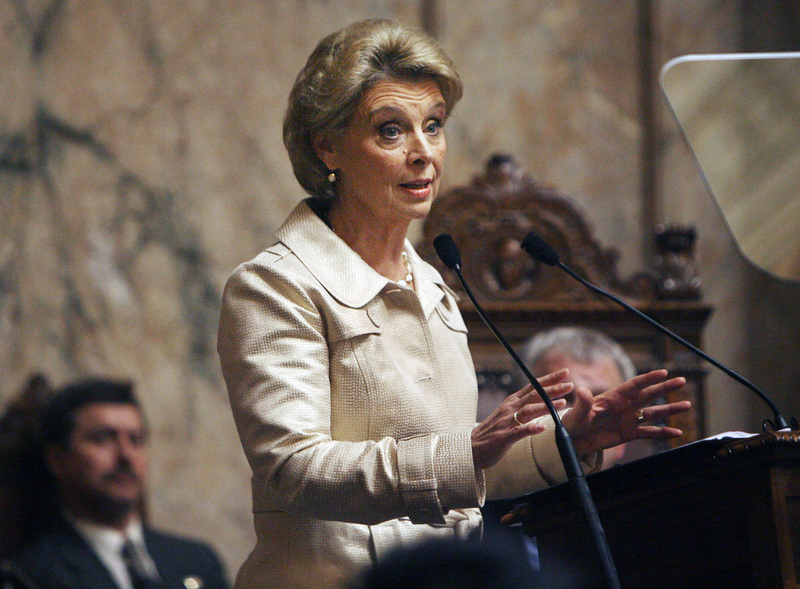 Gregoire described the state as undergoing the worst economic collapse in 80 years. Last year saw 475,000 people sign up for unemployment benefits, one in 13 residents receiving food assistance, 26,000 homes put into foreclosure and 86,000 people go on the Basic Health Plan. State revenue projections have been dropping ever since the Legislature adjourned last spring. Although the revenue may level out by February, the requests for unemployment benefits and welfare may continue to grow for months, she said. Gregoire said she wanted to close or reduce 10 state institutions, including the Pine Lodge Correctional Facility in Medical Lake. She wants to eliminate 78 boards and commissions, and reduce or eliminate about a third of the state’s 64 small agencies. The state currently has three regional growth management boards; she wants to consolidate them into one. It has five environmental appeals boards; she’d drop that to two. She wants to create a clean energy business development program to attract environmental jobs and streamline the state’s permit process. The state should give a tax credit for every new employee a small business hires, she said. Not far enough, legislative Republicans argued. The state should require all permits be issued within 90 days, allow residents to buy health insurance on their own rather than getting it through an employer, contract out some jobs, and get completely out of the liquor business, they said. And don’t raise taxes at all. In a later appearance before the Senate Ways and Means Committee, Gregoire and Office of Financial Management Director Victor Moore put some details on the budget. She listed some $779 million in spending that she wants to put back into the “all-cuts” budget she proposed in December. The state would still cut about $1 billion in spending, but eliminating some programs will cost the state more in the long term. She said the state could collect an extra $105 million by rewriting some tax laws. It can expect some money from the federal government as a continuation of economic recovery programs and through health care reform, but those amounts won’t be known for several weeks, she said. Gregoire seemed to underplay the call for tax increases and may be relying too heavily on federal spending, said Sen. Mark Schoesler, R-Ritzville, after her committee presentation. There’s a gap of nearly $675 million between the programs she wants to add back into the budget and the taxes she proposed raising. “Every governor’s State of the State speech in memory is long on good things and short on specifics,” Schoesler said.